Birds (and other interesting things!) 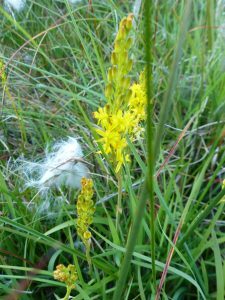 seen in and around our patch. Swifts at Stokes – at last! Noticed yesterday that Swifts were entering and staying in one of the 4 boxes at Stokes newsagents in the High Street, also that they were investigating 2 of the other boxes. 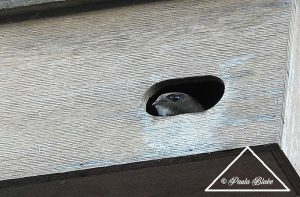 Have never noticed any activity there (other than sparrows) since the boxes were put up in 2006! Thanks to Paula for the pic which she took a day or so later. Angela T and myself headed over to Heyshott Common on the evening of 28th June. and also found some white cross-leaved heath among the more usual pink. We stopped where there was a clearing, and noticed a juvenile Stonechat close by doing a bit of “flycatching” for a considerable time in the fading light. The evening glow also illuminated a lovely roe deer stag not far away. After some brief tuning-up about 9.20, churring started in earnest at 9.40, with a very vocal male in the pine trees to the west. 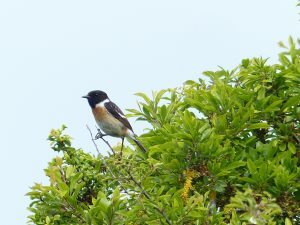 A female flew low across the clearing under the wires, and the male patrolled around, churring and wing clapping, at one stage churring in a tree only a few metres away. Had one excellent view of the male flying across the clearing, again pretty close, wing patches clearly visible, another couple of views of a/the female as well as several fleeting glimpses of the male as it moved from one stopping point to another. 10 of us made the trip to Ambersham Common on the 19th June. We had a little potter around Heyshott Common, the other side of the road, where we heard Woodlark, Yellowhammers and Linnets singing, followed by a sighting of a smart male Stonechat. On the short walk back up to Ambersham we heard a Song Thrush singing beautifully just above us in a pine tree. We headed up to the top of the hill and waited until, almost on the dot at 9.30, a single Nightjar started churring …. then stopped! About ¼ hour later it started again, then stopped and started as it moved around the cleared area. There were two heard there, possibly a third, About 10.15 we started back to the cars, but churring was coming from Heyshott too, so 2/3 of the party relocated there where we heard 3 different birds, and a lot of wing clapping going on in the dark area between us and the distant trees. We probably should have stayed that side of the road instead! and Stonechats & Turtle Doves! 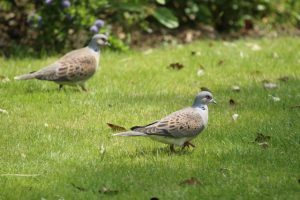 and Darrell had two Turtle Doves strolling around in his garden in Mill drive. There are 3 nests in the heronry near the Downslink, looks like at least 2 young in 1 nest, 1 in another, and could only see an adult on the 3rd. 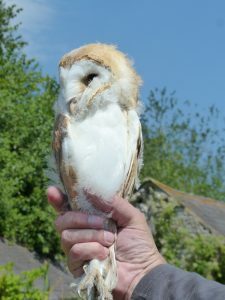 An SOS member who lives at Steyning emailed to say that he counted 13 Lapwing with 7 young on the big field south of the mill stream yesterday morning, and saw a Barn Owl carrying rodent prey. Excellent news! Hazel has counted about 20 House Martins over the newest part of the Deer Park Estate and Peter says “‘Our’ Swifts are back – up to 5 circling the house at various times, hopefully checking out the nest boxes”. And Will and Val reckon there are c33 Nightingale territories in “Greater Henfield”! i.e roughly the western 2/3 of TQ21 (and a bit of TQ22) including, Shermanbury, Wineham, Twineham, Henfield, Small Dole, Oreham, Edburton & Perching Sands. Seems a funny year, in that some of the more regular haunts don’t have quite as many, yet they are turning up in other spots but possibly then moving somewhere else in the vicinity. After three “nightingale drives”, plus adding in the birds heard by others the estimated total of Nightingales in our survey area was 33. This total is from a wide sweep of Henfield/Small Dole/Edburton Sands/Twineham/Wineham/Shermanbury, roughly the western 2/3 of 10km square TQ21, approx 60 sq km. First Henfield Swift of the year seen by Roger at West End Lane yesterday. And a Nightingale has turned up on Will’s patch by the alder wood at Woodmancote. Two Turtle Doves by the West Mill stream late afternoon yesterday, 1 Nightingale, and in the field between the stream and West Mill Lane were a singing Yellowhammer, Reed Bunting and a pair of Stonechats. Whinchat seen near Eastout, and first Turtle Dove reported in a garden in Furners Mead today. Swallows & House Martins chattering over the Lydds. Nice flock of about 20 Linnets in same field as Whinchat. 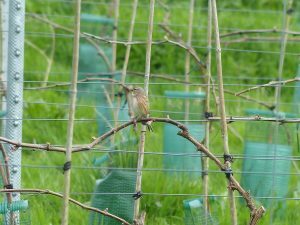 Only got pic of Linnet though. 28 swans in the fields at Brookside/Rye Farm, a single Lapwing, assorted geese and a Little Egret. A crow had a go at a Raven low by the Downslink & a Cetti’s sang from the bushes at the side. Only 1 apparently occupied nest in the little heronry. East of the Downslink a Reed Bunting sang its ineffectual song, 3 Lapwings tried to mob a crow, and 5 Linnets flew up from the grass. In the wet area were 2 swans, a Coot and a couple of Greylag. Another Cetti’s sang by the gate. Near Lepride a commotion from other birds alerted me to a Peregrine scything through the trees!